Moorland, the Heart of Exmoor | Helping people to enjoy and appreciate Exmoor's moorland and support those who take care of it. Helping people to enjoy and appreciate Exmoor's moorland and support those who take care of it. The Heart of Exmoor Scheme helped thousands of people to enjoy and appreciate Exmoor National Park’s moorland and supported those who take care of this precious landscape. The most striking aspect of this Heritage Lottery Funded scheme was undoubtedly its immense capacity to foster active partnership work and participation. A small army of people worked in partnership with the staff team, drawing expertise and energy from not just within the Partner bodies but a wide range of organisations and a remarkable number of volunteers from all walks of life – the farming community, local businesses, researchers, ecologists, archaeologists, artists, storytellers, students and the retired – all sharing their enthusiasm for the moorland. Thanks to everybody involved, we were able to inspire visitors, create exciting educational resources, research the moorland’s natural and cultural heritage and help to conserve it for future generations. We delivered 19 projects, plus an Evaluation project to assess the scheme. The Scheme made a massive impact with community engagement – not just in Exmoor National Park but also through outreach far beyond its boundaries and to river valley communities downstream. The Heart of Exmoor Scheme engaged over 14,000 visitors at events and over 7,000 on school visits. The scheme contributed significantly to events such as the Exmoor Archaeology Forum and the Exmoor National Park’s family-friendly Big Adventure Days. We also established major new events such as the Exmoor Pony Festival, the Exmoor Wildlife Forum and Bogtastic. We created the online Moorland Classroom with educational resources for 10 moorland sites, and the River Lyn. We produced a World War II teaching pack and 4 Archaeology Loan Boxes, all backed by outreach work, hundreds of school visits, and inspirational teacher training. The Partnership helped more than 560 trainees develop moorland management skills, employed 3 farmers as Moorkeepers, funded 3 moorland apprenticeships, and supported moorland managers to organise 26 practical demonstrations and 31 workshops about issues important to them – sharing experience and knowledge of livestock, scrub, bracken, burning, etc. The Heart of Exmoor Scheme provided new equipment worth £30,000 for loan to moorland managers, and invested over £30,000 in equipment to benefit the free-roaming Exmoor Pony herds (including £16,000 in Exmoor Pony Grants). We researched, safeguarded and promoted key elements of Exmoor’s moorland heritage with campaigns for e.g. Exmoor Ponies, the subtle prehistoric archaeology and the former Royal Forest. We added new data and resources to Exmoor National Park’s Historic Environment Record (HER) including finds, geophysics data, drawings, photographs and more than 20 archaeology reports. We launched Exmoor’s first ever moorland archaeology exhibition, and the first full assessment of its Principal Archaeological Landscapes. Our Community Archaeology project brought volunteers, academics and professionals together on groundbreaking investigative and interpretive moorland archaeology work. Pilot projects such as Moorkeepers and Demonstration Moors led onto innovations such as Graze the Moor demonstrative study on Molland Moor. We provided 52 wildlife skills workshops, and supported major wildlife surveys and campaigns e.g. RSPB Moorland Bird Survey, Exmoor Wild Watch, the Exmoor Crayfish Project. We published the new Moorland Birds of Exmoor guide, A Field Guide to the Royal Forest of Exmoor, accessible route Photo Trails, 4 Archaeology Walks, 9 digital artist’s impressions of landscape scenes from Exmoor’s past, and Sounds of the Exe – 8 clips of an audiovisual journey along the Exe Valley from source to sea. We delivered 5 major landscape character projects and supported 10 smaller projects. More than 5,400 volunteer days contributed to the scheme’s success, valued at over £425,000. The Exmoor Moorland Landscape Partnership Scheme was supported by the Heritage Lottery Fund and our local partners and funders. Part financed by the European Agricultural Fund for Rural Development 2007-2013: Europe investing in rural areas. 2016 sees the launch of the third year of the Exmoor Wild Watch Survey. Exmoor Wild Watch is an opportunity to be part of a ‘citizen science’ project to find out more about some wild species particularly characteristic of Exmoor. Exmoor National Park Authority would love to hear from you if you see any of the 2016 Exmoor Wild Watch species. This year’s list of wildlife stars include new species and old favourites. 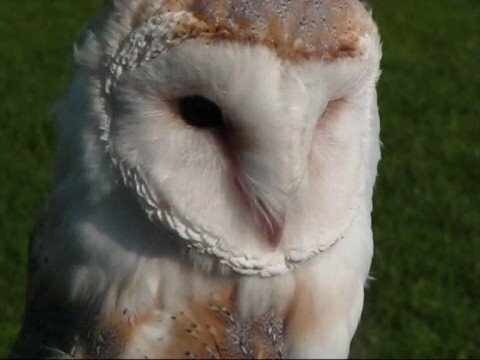 The full list is: barn owl, Daubenton’s bat, glow worm, toad, string of sausages lichen, waxcap fungi, harbour porpoise, hedgehog, common blue butterfly, cuckoo, red kite and kestrel. Records for 2015 ended with a real flourish with 400 new records sent in. Last autumn we received 18 waxcap toadstool records with sites including Foreland Point, Wimbleball, Brendon Common, North Hill and Hoar Oak Cottage. The hedgehog records kept coming late into the autumn. Did all the hedgehogs hibernate? Winter sightings would particularly be welcomed as would early sightings of toads and cuckoos. Submitting records is easy. Simply go online to www.exmoor-nationalpark.gov.uk/wild-watch and click on the species you have seen, and let us know where and when you spotted it. There you will find more information on each species. Alternatively please call the National Park Centre at Lynmouth on 01598 752509 to let them have your Wild Watch records. All the National Park Centres have a handy spotter guide. To find more Exmoor Wild Watch events and training in 2016 please visit the Exmoor National Park website. This is a collection of experiences from the viewpoint of volunteers and community groups who run their own projects, or have got involved with Exmoor projects in various ways. The aim of the case studies is to share ideas, advice and encouragement through examples like these, for people considering their own community or volunteer-based project. Click on a case study in the list below to view/download a PDF. 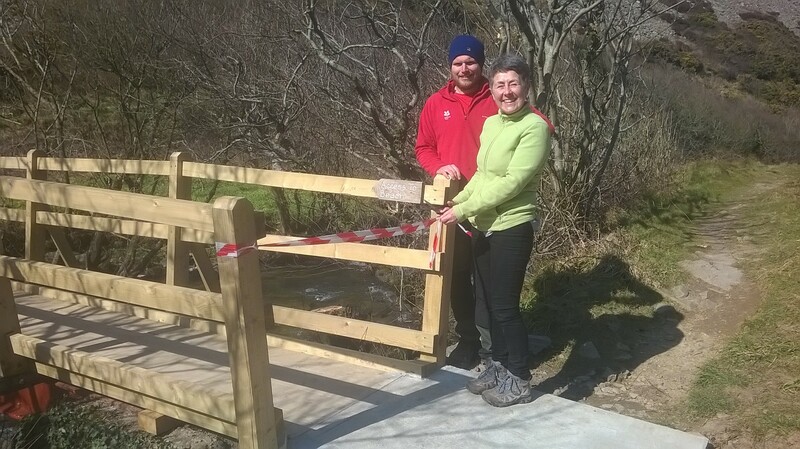 The National Trust has improved accessible routes around the beautiful Heddon Valley with a new bridge, thanks to a £3,000 grant from the Heritage Lottery Funded Heart of Exmoor Scheme. The National Trust’s off-road accessibility scooters are some of the most popular in Devon – enabling easier access along the wooded valleys to reach the coastal heath and the famous Heddon’s Mouth at the shore. It’s not easy to write a concise summary of a 5-year programme, but here goes! The Heart of Exmoor Scheme championed Exmoor National Park’s moorland landscape heritage for 5 years (Jan2011-Dec2015). Scheme Manager Jason Ball. MCMI (Dip Mgt), MCIEEM. Moorland Heritage Officer Faye Balmond. MA. Exmoor Pony Officer Linzi Green. Moorland Education Officer David Rolls. MSc. The Heart of Exmoor Scheme helped thousands of people to enjoy and appreciate the moorland, and supported those who take care of this precious landscape – farmers and commoners, landowners, rangers and volunteers. Thanks to everyone involved, we were able to inspire visitors, create exciting educational resources, research the moorland’s natural and cultural heritage and help to conserve it for future generations. A small army of people worked in partnership with the staff team, drawing upon immense expertise and energy from not just within the Partner organisations but also volunteers from all walks of life – the farming community, local businesses, researchers, ecologists, archaeologists, artists, storytellers, students and the retired – all sharing their enthusiasm for the moorland. The Heart of Exmoor Scheme engaged more than 14,000 visitors at events and over 7,000 on school visits. The scheme contributed significantly to events such as the Exmoor Archaeology Forum and the Exmoor National Park’s family-friendly Big Adventure Days. We established major new events such as Bogtastic, the Exmoor Wildlife Forum and the Exmoor Pony Festival. The Partnership helped more than 560 trainees develop their moorland management skills, employed 3 farmers as Moorkeepers, funded 3 moorland apprenticeships, and supported moorland managers to organise 26 practical demonstrations and 31 workshops about issues important to them – sharing experience and knowledge of livestock, scrub, bracken, burning, etc. Hailed as a success by HLF: a relatively low-cost scheme punching above its weight. The most striking aspect of this Heritage Lottery Funded scheme was undoubtedly its immense capacity to foster active partnership working and participation. Massive impact with community engagement – not just in Exmoor National Park but also through outreach far beyond its boundaries and to river valley communities downstream. Brought volunteers and professionals together to work on groundbreaking investigative and interpretive moorland archaeology in our Community Archaeology project. Provided 52 wildlife skills workshops, and supported major wildlife surveys and campaigns e.g. RSPB Moorland Bird Survey, Exmoor Wild Watch, the Exmoor Crayfish Project. Created the online Moorland Classroom with educational resources for 10 moorland sites, and the River Lyn. Produced a World War II teaching pack and 4 Archaeology Loan Boxes, all backed by outreach work, hundreds of school visits, and inspirational teacher training. Moorland management was a key aspect. Pilot projects such as Moorkeepers and Demonstration Moors led onto innovations such as Graze the Moor demonstrative study on Molland Moor. Added new data and resources to Exmoor National Park’s Historic Environment Record (HER) including finds, geophysics data, drawings, photographs and more than 20 archaeology reports. Delivered 5 major landscape character projects and 10 small landscape projects. Published the Moorland Birds of Exmoor guide, A Field Guide to the Royal Forest of Exmoor, accessible route Photo Trails, 4 Archaeology Walks, 9 digital reconstructions of landscape scenes, and 8 Sounds of the Exe films – enchanting audiovisual snapshots of the Exe Valley. The Heart of Exmoor Scheme was financed by the Heritage Lottery Fund, Exmoor National Park Authority and many local partners and funders. Programme 2, Reconnecting Livelihoods was RDPE funded by WSLA (Western Somerset Local Action) and L4TND (Leader for Torridge and North Devon) and by the Heritage Lottery Fund. Other major funders included the Heathcoat and Amory Trusts through The Exmoor Society, The Exmoor Trust, The Environment Agency and English Heritage. Contributions in cash and in kind from project partners and Scheme Partners helped immeasurably. The vast contribution of volunteer time effectively increased scheme value from £1.2m to £1.6m! Helping people to enjoy and appreciate Exmoor National Park’s moorland landscape, and supporting those who take care of it. Join the adventure! With family games and activities lasting all day in some of the most amazing locations on Exmoor. There is no charge for these events but donations to CareMoor for Exmoor are requested. All events run from 10am – 4pm except the Camp Outs which start at 4pm. Camping charges apply for overnight events. Wildlife Adventure Day. A programme of events throughout the day and night to survey the wildlife of Porlock Marsh and beach. Whether you are a beginner or expert, there will be something for everyone to get involved with. More details to follow nearer the event. For times and locations or contact Mel Worman on 01643 862452. This year’s ‘drop in’ event will feature the Bogstacle Course, stream dipping, wildlife walks, Bog safaris, the opportunity to visit one of the South West’s last remaining operational water powered sawmills, and lots more all-weather and undercover activities. Meet at Simonsbath Sawmill, TA24 7SH. For further information and a free event poster please phone 01598 752509 or see our Bogtastic facebook page. Discover what amazing bugs and beasties live in the streams and woodlands of Exmoor as we river dip and bug hunt down at Tarr Steps. Please wear outdoor clothing and suitable footwear. Tarr Steps Meadow. TA22 9PY. 01398 323841. Discover what amazing bugs and beasties live in the rivers and woodlands of Exmoor as we stream dip and bug hunt down at Lynmouth Green. EX35 6EN. 01398 323841. HLF has announced their Landscape Partnership programme is open for a new round of funding with up to £25m to spend in 2016. Enter your email address here, for automatic updates from this blog.